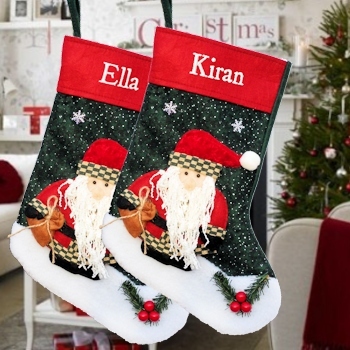 Personalised Felt Santa Christmas stocking featuring a plush Father Christmas character with full stringy beard and 3D holly and berries. Personalised Felt Santa Christmas stocking featuring a plush Father Christmas character with full stringy beard and 3D holly and berries. Beautifully decorated Christmas stocking in dark green and white with a crimson red band along the top made from thick sturdy felt. Stocking size 42cm diagonally top to toe, 20cm diameter cuff.